Introducing the latest generation of automated Toyota BT reflex Autopilot reach forklift trucks. Five new forklift models - with load capacities from 1.4 - 2.5 tons - deliver class-leading leading performance. All Toyota BT reflex forklift trucks have an advanced new transitional lift control system, which achieves high-speed - yet completely smooth - lifting and lowering. This advanced, intelligent design significantly increases productivity for faster work cycles, while supporting safe operations. Many companies can benefit from the automation of their manual material handling process. Our automated range of forklifts offer advanced, flexible solutions for more efficient, cost-effective goods handling. Advantages of automation in material handling include easy tracking of goods, just-in-time picking, less damage and fewer operator hours. Our automated guided vehicles autopilot range allows driverless operation for repetitive movements or order picking of goods. Based on standard forklift designs, Toyota BT Reflex RAE250 automated guided vehicle is fitted with the most advanced laser navigation technology and highest class of safety features. This Laser Guided Vehicle improve productivity and save cost by reducing labour, goods damage and risk for work-related injuries. They can be used as 'stand-alone' forklift in simple installations such as transporting goods, or in larger operations with multiple forklifts integrated with the customer's Warehouse Management System. Can also be used as a manual pallet stacker. 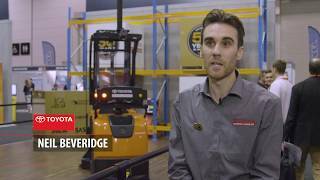 Fully backed by Toyota Material Handling Australia so you can be assured of outstanding customer service and support of your automatic guided vehicles (AGV) and automatic guided forklift fleet.